AL: Why a festival about West African films, not just African films? LW: Because the film industry in Africa actually began in West Africa. The rise of the African film industry can be traced back to the decolonization period of the continent. Despite the prior existence of such an industry under foreign rule, the African film industry did not reflect an accurate portrayal of the cultures it was intending to represent. Instead, the film industry was permeated by stereotypes and Africa was utilized merely as an “exotic” background for Western cinema. However, this underwent a significant change during the 1960s, when numerous African countries obtained their independence. This is especially true of the former French colonies, whose local filmmakers received technical and financial support from the French Ministry of Cooperation. Spearheaded by individuals such as François Mitterand, efforts to encourage the integration of African film production as a part of the cultural, political and economic development of the continent were further strengthened in the 1980s. Also, as the vast majority of films made before the countries´ decolonization were explicitly racist, many African directors who gained prominence post-independence, such as Ousmane Sembene and Oumarou Ganda, used the art of filmmaking as a political instrument in order to rightly restore their image which had been wrongly depicted by Westerners. Thus, African cinema came to strongly feature social and political themes and the neo-colonial condition. However, Africa is a vast continent and its countries and cultures have their own specific cultural, political and geographical backgrounds and elements that are uniquely expressed in a thousand ways in their films. In discussing what is unique about African films, perhaps it’s better to start with what is universal to film, including African films. All films are voices of culture, the choices that make us human, the challenges that bring us down, and the joys that lift us up. For example, some of the sweetest comedies are now being produced in Sierra Leone. Despite of all the country has gone through recently, their artists find a humanity that would be recognized anywhere in the world. Boy meets girl, girls parents don’t approve … it’s a common story. You can get a little window into the daily life of a Sierra Leonian in some of their comedies and short films. But there is something unique about African film because the history of the continent is unique. Nollywood films often touch on ancient fears and superstitions. Divisions also come to light in film. There have been some great documentaries about elections in Africa as Africa has come a long way in recent years in free and fair elections. The Potential of the African Film Industry. The African cinema industry acknowledges undeniably the need to develop its own way of making films, support their local initiatives, and invest in cinematic cultures such as films festivals. Although the African film industry does not currently attract the same levels of popularity claimed by the well-developed European and American industries, it has shown significant growth and progress in the beginning of the 21st century, a fact reflected in part by the creation of a Journal of African Cinema and African TV channels. Such mediums act as awareness raising mechanisms and promote the diffusion of films, allowing the African film industry to attract genuine interest from the international community. The media and entertainment industries are registering above average growth in many African countries and are expected to grow at 5% GDP per capita up until 2015. Many countries such as Nigeria, Kenya and South Africa offer the great opportunities for content producers and distribution platforms for film, television, digital media, mobile and other forms of entertainment. AL: Why should we care about film in Africa? LW: Africa is not a country, and the whole continent’s story can’t be the story of poverty and diseases alone. Our challenge is to get the world to understand and to tell a different story, a more accurate story of Africa, one country at a time. That’s why joining us for in watching African films is so important. Through African eyes and the film maker’s lens, you’ll learn about the dreams, joy, hope and amazing resilience that is Africa today. So if you thought Africa was one place, or a poor place: think again. Africa is making huge leaps forward. Perhaps one of Africa’s greatest assets is its highly diverse cultural, historical and social composition. An ever-growing film industry, encouraged by increased investments and the abolition of political censorship, will further add impetus to an already booming sector by allowing creative minds to harness this cultural capital. Furthermore, an expanded film industry translates into a flourishing labor market, providing new opportunities for young talent and thus helping to combat the global contemporary phenomenon of youth unemployment. The film industry of Africa will aid African countries in their quest for the universal goal of economic development. 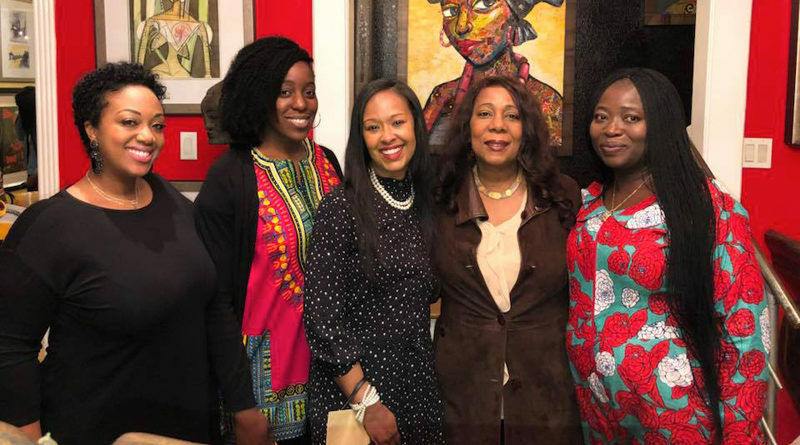 To celebrate all this, the west African film festival recently screened nearly a dozen films over the course of a week at several venues around Houston. I sat down with Linda Wuest and Natashia Clarke to find out more about the annual event. AL: How did the West African Film Festival (WAFF) begin? 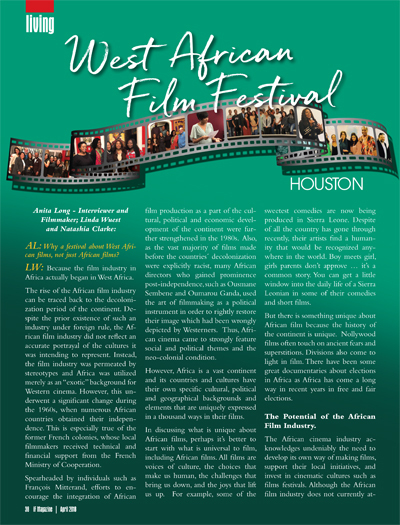 LW: The inspiration for the West African Film Festival in Houston came at about the time of the Ebola crisis. We found that a tremendous amount of work was being done by African artists, filmmakers, and musicians, who risked their lives to educate their communities about this disease. The quality of films was first-rate, even Oscar caliber. There was a world of great films: comedies that were smart and witty, wonderful dramas, histories, and documentaries, produced in West Africa, that gave the African perspective, one that was not being seen in the Western media. They were about courage, hard work, determination, and creativity. The Refugee Allstars, for example, is a documentary about a group of young men, survivors of war, who traveled around Sierra Leone singing songs about Ebola and how to protect yourself and family. It was an African story, a timely one, about survival, music, and giving. It was also a universal story, one of love, hope, education, and the choices that make us human. American audiences would love this film, with all the music, energy, and such a great story—but it wasn’t being shown anywhere! Natashia (who has a background in the film industry) and I talked about the lack of awareness of African media in the West. Why was the story of Africa not brought to us through the vision and voice of Africans? The reason, of course, is that African-generated media has limited distribution in the West. What little we hear about Africa is often generated by Western visitors and filtered through the lens of the Western mindset. We wanted to change that. Natashia and I felt that a West African Film Festival for Houston was needed to bring West African films to our community. We should be able to hear the story of Africa from African people themselves. We also hope to support West African artists by increasing distribution opportunities for West African films. NC: The WAFF is Linda’s brain child. I conducted my grad-school thesis research at the World Affairs Council of Houston from 2014 – 2015. In the summer of 2015, Linda approached me about joining the organizing committee of the film festival. She knew about my entertainment background from Los Angeles. The rest is history. I interned under Linda and It was a wonderful experience. We shared an interest in communication, film, and the power of images. We understood the need for films that could speak truth to power and we both felt that the story of Africa was not being brought to Western audiences accurately and completely. We formed a committee of friends who shared our commitment to the arts and our interest in films. The West African Film Festival was launched! AL: What was the biggest challenge with organizing the festival in the beginning? LW: In Houston, finding appropriate venues is always a challenge. There was no single screening location for the festival that was both affordable and available as the principal location, there was no central building that was convenient to all potential audiences. 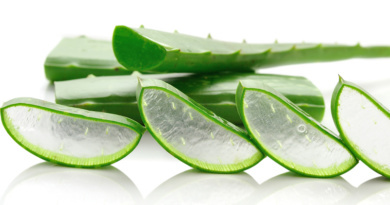 To serve Houstonians from Clear Lake to Sugar Land meant finding multiple locations. Natashia felt that university screening sites might be a good choice. The next challenge was communicating to the entire community: Anglo, African-American, Asian—everyone. And, as with most start-up ventures, funding for advertising, a web site, etc. was a challenge. A great team of interested friends was gathered, under the leadership of Natashia Clark. Interestingly, finding great films was not difficult. We announced the festival through FilmFreeway and the response was tremendous. African film makers were delighted to find us and to cooperate with the festival. NC: The biggest challenge was trying to determine the direction of the festival. We wondered if we should approach the universities about being venues or fundraise for the rental of a movie theatre. How do we mobilize African and African American social groups to help with the needs of the festival? Many thoughts and questions about how to organize the festival went through our minds. AL: How has the festival grown throughout these three years of its existence? LW: The word has gotten out and the festival has grown each year. Universities and high schools see the films as wonderful learning opportunities for students. The large Ghanaian and Nigerian communities in Houston are delighted to see their country’s talent spotlighted. We want to thank these friends, the World Affairs Council, and the associated universities. NC: The festival has grown through an increase in our audience membership and participating organizations’ help, such as World Affairs Council of Houston, Gite Gallery and Ismaili Jamatkhana and Center. The public is becoming more aware of the festival. AL: What are you doing now to improve the festival? LW: I’d like to see more corporate participation, both in supporting the event and in encouraging employee attendance. Many Houston companies have business activities in West Africa and may want to improve their employees understanding of the region. 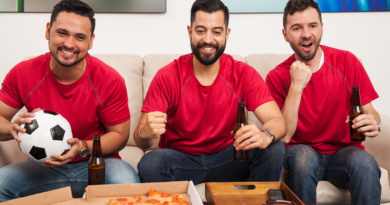 Participation in the film screenings is a fun way to accomplish that. And corporate logos seen in association with the festival tell the Houston community, as well as West Africans, that this company honors the voices of Africans and supports their work. NC: We are currently trying to fundraise for better awards for our participating West African filmmakers who gained selection into our festival. AL: What else would you like the public to know about the future direction of the WAFF? LW: The West African Film Festival is a great addition to Houston’s cultural offerings. In the future, we hope to be able to bring West African actors, producers, and directors to Houston for discussions of the films and ‘meet the director’ opportunities. We’d like to offer workshops for young Houstonians who may want to pursue a career in films. The countries of West Africa have made substantial progress in recent years, getting past Ebola and moving forward on economic development and democratic institutions. Our understanding of–and connection to–West Africa should make some progress, too. Let’s get past the old view of Africa 50 years ago. Through film, we can see the region for what it is today, for the astonishing beauty, the rich human story, and all the promise and possibilities that exist. We hope that everyone will put the West African film festival on their calendar each year, tell their friends, and help us make the festival the biggest and best in the US. 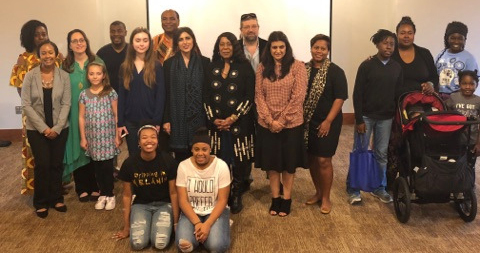 NC: We would like the public to know that we will continue to show West African centered films that discuss social injustice and empowerment as well as illustrate the broad range of beauty and talent of the region. In addition, we will eventually add a conference component to the festival that will allow West African and Houstonian leaders from various industries to share best practices. Locations of Film Festivals Harmony Public Schools, University of Houston Clear Lake, Rice University Cinema, HCC Center of Excellence Media Arts & Technology.